A Walt Disney World employee died in an industrial accident on Monday near Pop Century Resort in Orlando, according to the Orange County Sheriff's Office. 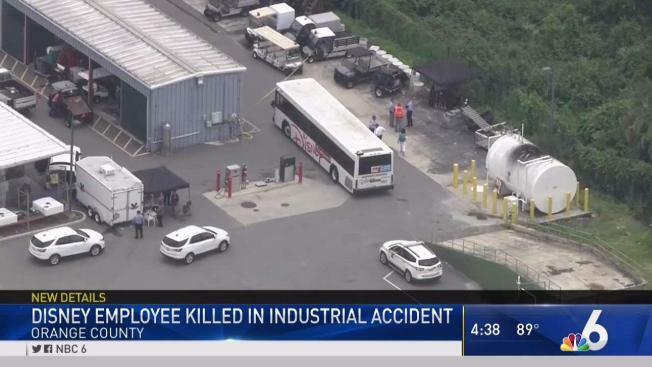 Authorities have identified the Walt Disney World employee who died in an industrial accident on Monday near Pop Century Resort in Orlando, according to the Orange County Sheriff's Office. Orange County Sheriff's spokeswoman Ingrid Tejada-Monforte says Juan Alberto Ojeda was pronounced dead at the scene on Monday. OCSO said it received an emergency call at about 9:15 a.m. to respond to a guard gate by the resort. Authorities found an unconscious man, who was later pronounced dead by the Reedy Creek Fire Department, WESH reported. Officials are investigating the circumstances surrounding the man's death. OCSO described the unidentified man as being in his late 30s. "All of us at Walt Disney World Resort are deeply saddened today by the loss of one of our Cast Members," George A. Kalogridis, president of Walt Disney World Resort, said in a release. "Our thoughts and concerns are with his family, friends, and fellow co-workers. This is a tragic accident, and we are providing resources and care for those impacted and working closely with the proper authorities to understand how this happened." Construction continues on an aerial transportation system that will use gondolas to connect hotels including the Pop Century resort to Epcot and Hollywood Studios.